Sorry, guys I'm working on it. Hopefully be done today! Thanks a lot everyone! This has been a cool experience, sorry it took me so long. -Do you think those sunglasses make you look fly? -What's your favorite PK/FR movement and why? I love combinations that have me travel large distances using simple, powerful movements. I also love training moves that force you to focus and be in the moment (see this blog post http://www.americanparkour.com/alliance/2009/10/moment.html). In particular I like dive-rolls, diving kongs, and diving front-flips over obstacles. The feeling of flying headfirst through the air is unique and highly enjoyable. -Have you ever done any other sports? I grew up playing ice hockey. From age 4 until 18 there was never a time when I wasnâ€™t playing. Some summers I would play indoor roller hockey. I never had time for any other sports, though I always wanted to get into martial arts. I was always playing and inventing sports with the kids in my neighborhood. Watching sports never really interested me though, I canâ€™t seem to get into it like a lot of people can. -Do you prefer Urban or natural environments for training? Both are necessary for a full mastery of movement and environment. I have to say that I do prefer training in nature though. Thereâ€™s something relaxing and revitalizing about being outdoors: the sounds, smells, sights, feel; it makes for a nicer overall experience. That said, training in urban environments tends to be more fun because you can move faster and with more confidence in the structures. -How is your week to week, day to day training structured? I teach classes up to 15 hours a week so that becomes a big part of my training. I like to hit a strength workout (squats, bench press, weighted pull-ups, weighted ring dips, deadlifts, etc.) 3 times a week, a Cross-fit type metcon 2 or 3 times a week, and a hard parkour-based workout once a week. Other than that I train on my own or with a couple of peers several days a week either outside or in the gym. I donâ€™t rigidly structure my programs, but Iâ€™d like to start doing that more and more. -When are you crazy D.C. cats gonna come up to Frederick and Jam out? Hopefully soon! Iâ€™ve reluctantly missed the last couple due to schedule. The place where a thief keeps the things he steals. How'd you get such perfect handstands? Any special tips (besides practice, practice, practice)? strength rather than good technique. Having a base of strength is a good thing to start with and beyond that itâ€™s exactly as you said- practice all the time. Every time you have a free second, kick up in to a handstand. Eventually (very eventually) youâ€™ll find the balance to it. Name five books every traceur should read. Please state why and support your claims with well-sourced and cited evidence. What would you say is the most important aspect of your training? Can I say well-roundedness? Is that an aspect or the inclusion of all aspects? I believe in being able to move oneâ€™s own body, other bodies, objects, the mind, everything. I think always keeping longevity in the back of your mind with everything you do is important. With everything you train you have to think about how this will affect your body in the future. Those little aches and twinges and tightness will manifest later in life as big aches and pains. So, now that I think about it, recovery is one of the most important aspects of my training. Stretching, foam-rolling/tennis balls, ice, rest, eating right etc. All training breaks down the body, if you donâ€™t work just as hard to help it build back up youâ€™re only getting half the benefit. Do you have a favorite city in which to do parkour? Iâ€™ve been to a lot of places around the country to train. My favorite is still Ann Arbor, probably for sentimental reasons more than anything, I grew up there and started training there, but the spots are numerous and diverse, the authority is receptive and understanding, thereâ€™s a bunch of good, dedicated people, the only downside being the weather in the winter gets a little much to handle at times. I also like DC, especially for Great Falls park. What is your absolute favorite thing about parkour? Thatâ€™s a tough call. I love the feeling after a productive, intense training session by myself. On the flipside I love the community and the people Iâ€™ve met and getting together with friends to mess around and train. Take your pick I guess. If you had to name yourself as a species of monkey, what kind would it be? Where do you see the parkour/freerunning community in 10 years? Good question. Realistically, as it gains popularity it will gain more attention from those in authority positions who will ban the practice outright in order to protect themselves from lawsuits. This will necessitate more parkour-specific areas such as outdoor parks and gyms to be constructed. I canâ€™t wait to see the sorts of movements people are innovating at that point though. What was your most embarassing parkour-related accident? Travis, I trained with you once in Michigan and you were constantly talking about the importance of footwork toward flow. How did you develop such good footwork? Developing footwork is a matter of starting slow and working on smoothness before moving faster. Thinking about where your step should go to optimally set up for the next movement is important. Also, was the "shades" look influenced at all by NYPK's own exxon? The shades look was influenced by the sun and its brightness. Thereâ€™s no way I could rock some shades like exxon can either. -How do you balance time between training, work, social life, studying or whatever else? My work and training tend to be intertwined a lot. So does my social life for that matter. I spend most of my waking hours at the gym either teaching, training, or doing work for Primal or APK. I spend a lot of my time outside of the gym with people I know from the gym. Itâ€™s an interesting community in that way. I suppose I donâ€™t balance those things very well, itâ€™s all just the same. -Whats the most challenging parkour related experience you've had? Any advice on how others could/should handle similar situations? For me, keeping my mouth shut and/or being polite to the people who try to kick you out of a training spot. I donâ€™t mind in the slightest if someone is reasonable and polite in asking me to move on, but if they get hostile or condescending I have to really work not to say something Iâ€™ll regret. -If you could fight any historic figure, who would you fight? WHat is you background before parkour? I played ice hockey my whole life and just always monkey-ed around trying to teach myself to do flips, and using playgrounds to exercise. WHat is the most important aspect of your training? I answered this for Hannah W above. How important is weight training for you? -What's the best short advice you could give someone who teaches Parkour? Stay humble and flexible; be willing to change your mind about things if new information comes to you. Learn from your students as much as they learn from you. Find the balance between fun, enjoyable, and joking and hard work, tough training, and pain. -Got a favorite type of environment/obstacle? I like long, multi-level runs as opposed to small, technical rail sections for example. -Do you think something in your past helped you to become interested in Parkour? In other words, any early signs? Iâ€™ve kind of done parkour-type things my whole life. One of my old teammates from a hockey team still tells a story about walking in to an arena and seeing me sitting on top of 10-foot wall, I had done a wall-run to get up there. This was several years before I became aware of parkour. I like both. Sprint training is more effective towards gaining athletic ability, but I like taking long jogs through the woods or just exploring the city that way. How much time have you put into learning flips and other movements like that? Iâ€™ve rarely had consistent access to a gymnastics facility and Iâ€™m always really careful in my training so itâ€™s been tough to make big gains in terms of acrobatics. I think training flips and basic gymnastics is a good compliment to any training routine as long as you do it correctly. I see a bunch of stupid kids chucking sloppy flips without bothering to learn form and I think thatâ€™s what gives acrobatics in parkour a bad name. I like having a few flips that I feel supremely comfortable with and can throw in a variety of situations without really thinking about it. Do you think traceurs will become the next presidents and politicians or the like? Why do you train parkour? Thereâ€™s a lot I could say here. I spent a lot of time thinking about this and trying to get to the root. 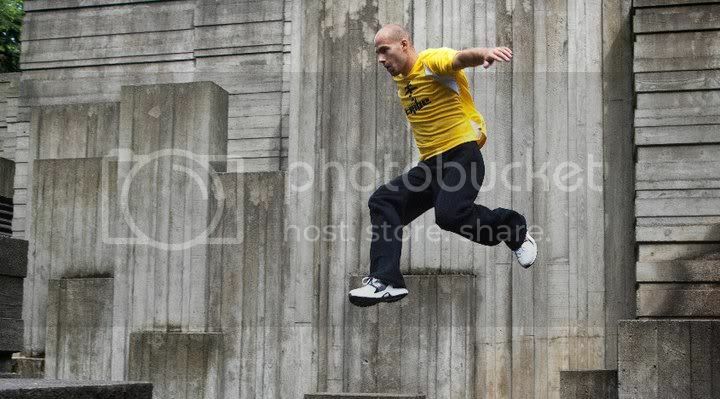 I think when it comes down to it I train parkour because I like to. For whatever reason, it is enjoyable to me. What's harder: training yourself or teaching parkour? Probably training myself. I have to act as both student and teacher, motivator and actor. Tell us a story about teaching. One of the toughest things Iâ€™ve gone through is someone getting injured doing my drills. This first happened at one of my sessions at Michigan. One of my better and more experienced guys broke his clavicle doing a landing and roll. I felt terrible about it and spent 3 hours in the hospital with him. It took me a while to realize it wasnâ€™t my fault and let go of the guilt. Where haven't you traveled for parkour that is on your wish list? Pretty much everywhere overseas. Parkour has given me an amazing opportunity to travel around the country, which is something I hadnâ€™t done much of before. Itâ€™s one of my favorite parts. -Did you ever get around to watching the Saturday Night Live "Massive Head Wound Harry" skit that Blake was talking about at the Ann Arbor Jam? Yes, pretty classic. Blake is always good for finding those sorts of things. -Can I has your shades? -Do you like to "move it move it"? Two â€œmove-itsâ€� is a little much for me. I think itâ€™s safe to say I like to move it. > Is there any story behind having the name "Noble"? Is it a family name or anything? It was the first name of my great uncle. To be honest I feel kind of pretentious using my middle name. I started using my first and middle names as an internet pseudonym, then realized I didnâ€™t care if anyone knew my real name but I felt like I couldnâ€™t just change it to my last name. Anyway, Frosti is really jealous that I have such a badass name. > Can you give any information on the APK "Parkour Teaching Certification" I've heard rumors about? It is in development, weâ€™re hoping to have some information to release in the coming months. whats your average training/conditioning routine? I answered this above, Elet asked me. how often do you train/condition? I do something every day. Consistency is key, but learning to rest and recover is just as important. Iâ€™ve been thinking about that, I canâ€™t really come up with anything aside from some books I want. Any suggestions? any tips on training and advancing flow? Going slowly at first and focusing on perfecting movements will lead to better â€œflowâ€� (continuation of momentum and movement.) You canâ€™t just start moving faster and expect to have good flow. There is so much more information I need to be able to give you a helpful answer. A lot of people like a 3-days-on-1 day-off protocol. music or not while training? Never with headphones. You need the awareness that your hearing provides. Just try being aware of every sound: your footsteps, breathing, the sounds of the environment; it becomes like music. How did get such huge air for your side flips? Pretty much flying last time I saw you at the Ann Arbor Jam. Iâ€™ve been doing them for a long time and I just re-tooled my take-off to get more amplitude and be lighter coming off of the ground. Itâ€™s all about timing and being comfortable in the air. Practice. Thanks for the responses and for being so cool, Travis! Thanks Travis!!! I love Catch 22, such a great book. I'll have to put the others on my list. I really appreciated the story about teaching too. Thanks for giving us your time, Travis! Awesome answers. Very sincere, I appreciate that. I highly suggest The Inner Game of Tennis by Timothy Gallwey. (No seriously, read this book) I picked up a copy from a used bookstore for $1.49. Way of the Peaceful Warrior- what a book. It really made me think about everything and anything, but sometimes it angered me. A lot.